Effective ways of working with young people at risk and in trouble are in demand at present, at neighbourhood level, as well as more formally through the courts and police final warning referral programmes. Changes in legislation and the development of new multi-agency youth offending teams are providing new contexts in which such work can take place. "...show that practice, programming and policy making can all go together...in a book that is not only instructive but enjoyable." "provides a pragmatic set of ideas and tools with instructive examples, that will benefit all those working in this field. It asks, indeed challenges, the reader to think innovatively." 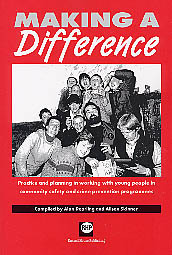 Chapters include: games and activities, staff development, training and work with volunteers, befriending, working away from base, school-based work on violence, bullying and offending, mentoring, working with victims of crime, institutional work with serious offenders, social action strategies for neighbourhood work, and community-oriented evaluation. These techniques and activities are appropriate for youth workers, members of youth offending teams, community-based projects, teachers, indeed almost anyone working with young people. "There are ideas, guidance and examples in this book that will guide, encourage and provoke. At a time when it sometimes appears that novelty is all-important, it is vital that we are reminded that we should not lightly cast away the lessons of prior experience. ‘Making a Difference’ is that reminder and I recommend it highly."